In this third and final part of my New York Newbie article series, I’m sharing my tried-and-true advice to help you make the most out of your new life in the Big Apple. The city has so much to offer actors, but we can certainly get into a grind trying very hard to prove ourselves. We cycle from class, to auditions, to our day job, then back home to rinse and repeat. However, it’s important to make time to find new inspiration and have a little fun. FEED THE HUMAN: This is my favorite phrase to use with actors. Not only does this action replenish your soul, but it keeps you interesting as an actor. You want to be able to have human to human connections when auditioning and working with others in the industry, and that will be difficult if your days are all work and no play. Here are just a few of my favorite spots in New York City to continually enrich and energize you as a performer and feed the human. Getting a IDNYC card is super easy once you have an address in New York. A New York ID can get you FREE 1 year memberships to a majority of New York City museums and landmarks. Most people in the Theatre District hover around 8th and 9th Avenue. My favorite spot, especially in the summer, is Bryant Park. It’s mostly a 9 to 5-er commuter spot, so the show schedule leaves the restaurants less crowded, and there’s an outdoor space. At the holidays, it’s an ice skating rink, and although it’s crowded, there’s amazing people-watching and unique shopping and food selections. Located on 50th between 8th and 9th, this is what we like to call the green room. You will see so many actors taking a break and sitting in this outdoor area. A great place to mingle and meet friends. Right in the heart of the West Village (there’s also a location in Williamsburg) is a lovely community of hot yoga people. Many of the instructors are currently working on Broadway, and there’s nothing like yoga to connect you to the Source. Home is where you heart is. Take the time to make your home a place that you can relax and recharge. No matter what your living situation you can add little things, a light fixture, blanket, or window treatment, to give your home a feeling that you never want to leave. No matter what you like to do, I challenge you to start brainstorming ways to Feed the Human, so you have them at the ready when you need them. You deserve to live life now and not wait for life to be lived at the other end of your accomplishments. 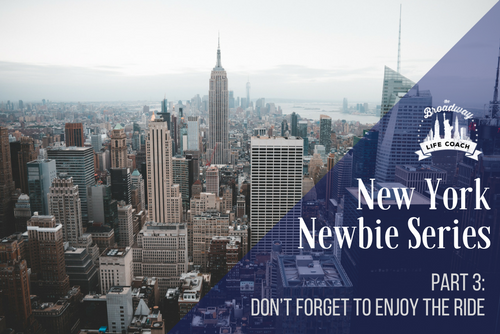 This is Part 3 of the 3-Part New York Newbie article series, where I share my “wish I knew then” advice for actors making the move to the Big Apple. You can read Part 1: The Reality of Moving to New York City by clickinghere and Part 2: How To Get Your Foot In The Door by clicking here.